1. Place the cous cous in a bowl and pour over the hot stock, cover and leave for 5 minutes, then fluff up with a fork. Meanwhile, poach the fish in water for 5 minutes. 2. Mix the remaining ingredients into the cous cous. 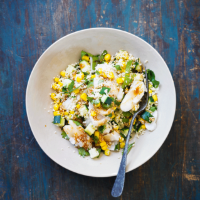 Break the cod into large flakes, stir into the cous cous salad and serve.